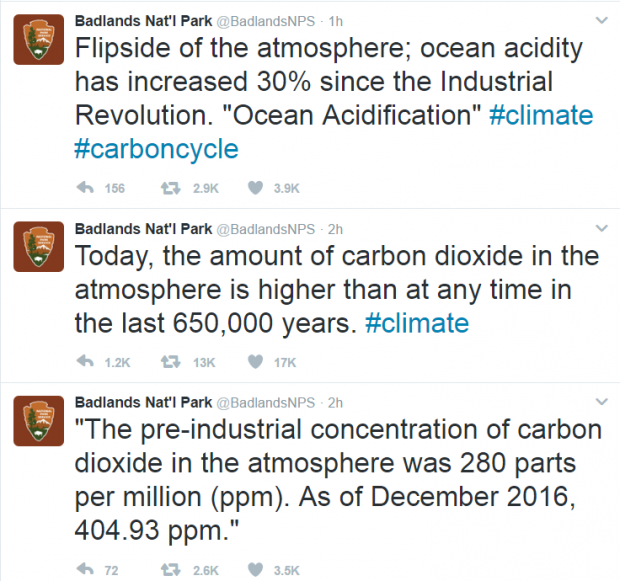 A former employee “compromised” the official Badlands National Park (BNP) Twitter account Tuesday and published a series of tweets about global warming that seemingly have nothing to do with the park’s mission. Badlands National Park’s account tweeted three messages about the level of carbon dioxide in the atmosphere, claiming the greenhouse gas increased ocean acidity since pre-industrial times. It’s not really clear how CO2 concentrations and ocean acidification lines up with the National Park Service’s mission, especially since Badlands National Park is in landlocked South Dakota and wouldn’t be affected by ocean acidification. The NPS “preserves unimpaired the natural and cultural resources and values of the National Park System for the enjoyment, education, and inspiration of this and future generations,” according to their website. Official Badlands park tweets generally have to do with animal species living in the park, its history and quotes from conservationists. Every once in a while there’s a tweet about climate change, but not stacked together like Tuesday’s. It turns out, a former National Park Service employee “compromised” Badland’s official Twitter account. The tweets come after the National Park Service official Twitter account was shut down for sharing a New York Times post comparing President Donald Trump’s inauguration crowd size to President Barack Obama’s in 2008. The Park Service also retweeted an Esquire.com article claiming all mentions of “climate change” were scrubbed from Whitehouse.gov. Their Twitter account was temporarily shut down, but was up and running again Saturday with an apology. The Badlands tweets also come amid news federal agencies under a “gag order” not to use social media or speak with members of the press. The Trump administration says they’re looking into the matter, but federal employees could be actively defying the order. Some Twitter users seemed to think so, including reporters. the Badlands National Park Service twitter account, @badlandsNPS, has gone rogue. The National Hurricane Center had its own social media snafu over the weekend, sharing a Facebook statement from Vermont Sen. Bernie Sanders critical of Trump. NHC apologized for sharing the political post, but then quickly deleted its apology.